I'll be at the Northwest Bookfest in Kirkland this weekend, handing out bookmarks and post cards. I had planned to be selling the book as well, but even the wriggle room I left in the schedule cannot manage truly unpredictable human events. Jesse Brown, the book's designer, broke a bone in his right thumb and put up with a good bit of temporary trauma in that hand as well, exactly five weeks ago today. He's hoping next week to pass along the finished product for a final read by Molly Martin before we ship it to createspace.com. 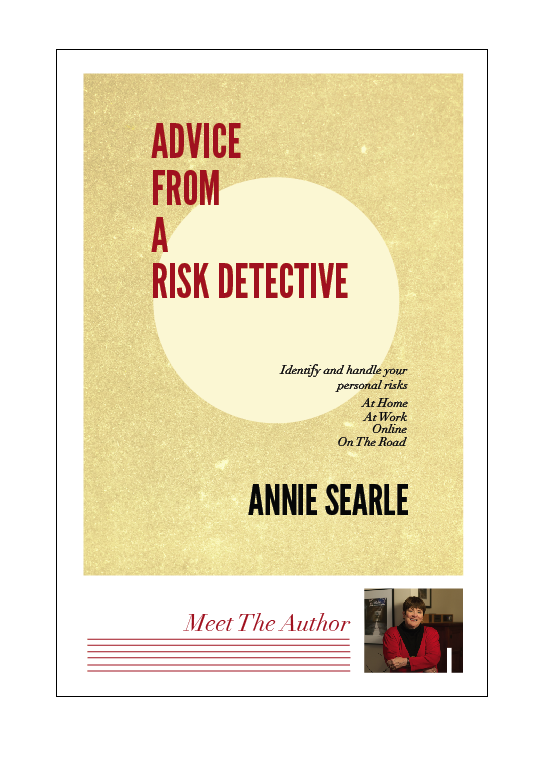 "OBE" or "Overcome By Events" happens to everyone, even a risk detective. The full list of inductees for the International Network of Women in Emergency Managment came through this morning. I am in distinguished company. 2010 - Carmen G. Rodriguez, the first female Fire Chief of the Puerto Rico Fire Department - Bomberos de Puerto Rico (BPR). I've been invited to Las Vegas in November to attend the 2011 Inaugural Induction Ceremonies and the 70th Anniversary Celebration of Women in Homeland Security and Emergency Management, where I'm one of 20 women to be made members of their Hall of Fame. "Mission: “To honor in perpetuity those women citizens of the United States, its territories and Tribal Nations; and around the world, whose contributions to the field of emergency management and its profession in local, state, tribal, and federal governments; critical infrastructure facilities; voluntary, faith, and community-based organizations; private and nonprofit sectors; academia; military; industry; and professional associations, have been of greatest value for the development of our nation and world. Purpose: To celebrate and recognize women, around the world, who have made outstanding achievements and significant contributions in the emergency management professional field, to elevate the status of women and girls, or in community outreach; and to motivate and inspire young women to envision and expand their horizons and fulfill their dreams and goals as an emergency manager." It's not clear how I appeared on their radar, but this is a high honor. Dr. Jacqueline McBride wanted first to induct me using the year 1975, but I was at that time still back in upstate New York at work in the visual arts. Though I can make a good argument that I've been a risk detective my whole life, proving that I've been responsible for emergency management functions that early would be a stretch. So we settled upon the year 2001, given that I became a senior executive with responsibilities in the area of private sector emergency management that year. The ceremonies will be held in conjunction with the IAEM 59th Annual Conference & EMEX 2011. We're in a bizarre, disheartening environment. Not much good news is getting through. The tendency is to hunker down, to play it safe, rather than figure out how to go out on a limb and re-think one's strategy. What works well, despite the economy? What inspires you, outside your job? What pleases you? None of these questions cost more than time to consider. And you may learn something new about yourself in pondering them. The autumnal equinox is as good a time as any to start. In the last chapter of my book, using travel as the metaphor, I talk about how the risk of taking no risks is that you stop growing. So start thinking about where you can travel, mentally or literally. Learn something new. Read something that's out of your comfort zone. Invest in a project that's larger than yourself. Your family and your colleagues will thank you -- you will have become a more interesting person and, I would guess, a happier one as well. A box of postcards arrived this morning. Only one version of a postmark stamp at the post office, and they are delicate versions of herbs. Had I known when the book would be done, I could have asked for a magnifying glass stamp. Here's an advance look at the book's cover, via a large sign being made to use at book events. The designer is Jesse Brown. I had another fine email, this one from Jerry Gross, the CIO at Washington Mutual who promoted me into an executive job and who named me "The Princess of Darkness." He really likes the book, and has offered to write a review when it is published. What an honor! And I just had a call from Lauren, who is back at UNC/Chapel Hill, checking up on the book's progress, lobbing suggestions on bookstores where she thinks I can snag a reading. I guess that would start with Third Place Books Ravenna, where I spend several afternoons a week, working over a pot of tea. I've kept a personal journal since 1981. 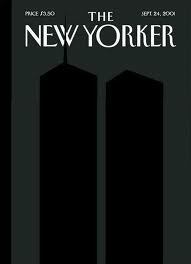 I went back to check my recollection of September 11, 2001 this morning. I remember being at home in the kitchen, ready to leave for work, when word came over the radio of the first plane hitting the tower. There was no employee alert notification system in place at the bank, so I got in my car and drove to work. By the time I arrived, the second plane had hit the World Trade Center and the Pentagon was not far behind. I think of this day as the beginning of my business continuity career. It became apparent that we would receive no direction from the bank's executives, who were all cloistered in an emergency operations center across the street watching television news, along with my boss. After fruitless attempts to reach my boss -- we later found out that none of the cell phones worked in the EOC -- I told my employees that they should make their own decision about whether to stay at work or go home. Ten days later, I was offered a senior vice president position in the new CIO's organization, in part because of questions I had asked about the bank's readiness to handle such events or even to get information on bank employees based in Manhattan. A month after that I assumed responsibility for technology recovery operations. It took several years to build a truly redundant technology infrastructure. When another set of events overtook us in 2003-- the "slammer" virus -- the executives at the company turned over the business continuity side of the operation to me. From that base, we gutted existing programs and rebuilt a comprehensive technology recovery, event management, and business continuity program under the umbrella of the Office of Continuity Assurance. In the years to follow, we reduced outages to operations from natural disasters, terrorist threats, or from technology outages by over 50%. And I committed myself to working on projects at a national scale that increased public-private sector emergency preparedness. Today, my firm participates in several global risk projects that seek to ensure we are never again caught unprepared. Every time September 11th rolls around, I remember the yawning gaps in the company's readiness to handle such an event and the trajectory that those events put on my own career. It's not something I cover in Advice From A Risk Detective, but the point I'm making probably is made indirectly in the book. Ten years later, we should be moving forward. We should be personally more prepared to handle any type of contingency than we were then. 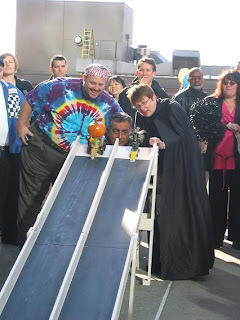 Spotting our cars on the racetrack for the 2003 Zucchini Race, with Mike Spalter, infrastructure chief (a la Jerry Garcia), on the left and me on the right, as the Princess of Darkness. Back in 2003, my nickname was "The Princess of Darkness," a title bestowed by former WaMu CIO Jerry Gross. When asked in a managers' meeting about the condition of our earthquake preparedness in Northern California, he said in his plummy Aussie tones, "Oh, let's just get the bloody Princess of Darkness up here to answer your question." I think my interest in dark topics preceded the nickname, but it became a way to costume myself for annual zucchini car races that kicked off the season's United Way campaign. 2007 Zucchini Races, with a colleague who also raced a car. I kept my Princess of Darkness persona until I left JPMorgan Chase in 2009. Shortly after I took that nickname, my husband hand-carved a stamp for me with which I mark my books to this day. When Carolyn Douglas interviewed me for KING-TV about my new business that June, it was my own words that created the new identity. "Think of me as a risk detective," I said. Now we have taken that metaphor and made it resonate throughout Advice From A Risk Detective. I can't wait to hear what you think. It's a beautiful Seattle morning, the first day of September, which is National Preparedness Month. There are a number of sites where you might look to see how you and your family can become more prepared for natural disasters or other types of events that knock out power to your home. I like the site hosted by the Centers for Disease Control, an organization that's been utilizing Facebook and Twittter for several years now. Here's the link: http://www.cdc.gov/features/beready/ . September is also the month when Advice From A Risk Detective will appear, late in the month. It has checklists as well as tips for plans and precautions you might want to take to manage your risks at home, at work, online and on the road.